You may have heard about the 'unbanked'. 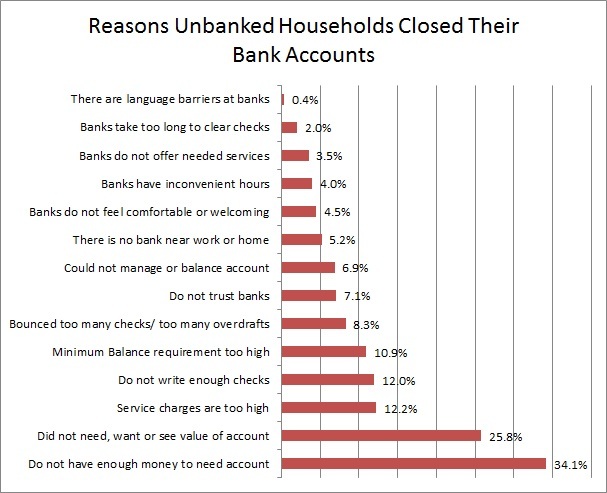 The unbanked are people who do not have a bank account. They don't have a checking or savings account. The FDIC has a whole web site discussing the topic. In December 2009 they wrote a report all about the demographics of and reasons for people being unbanked. 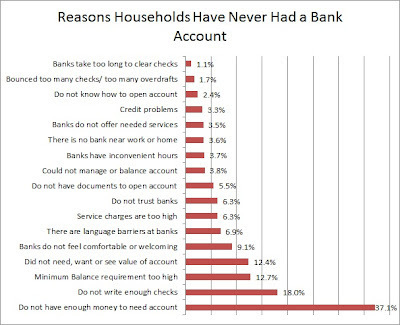 I've pulled out of that 2 specific charts showing why people don't have bank accounts. There are 2 groups among the unbanked, first the people who have never had a bank account and second are the people who once had a bank account but do not currently. First lets look at the never banked. All this data is from the FDIC report dated Dec. 2009. Note that the numbers add up to more than 100% because people could choose more than one reason so some people have multiple reasons. The sum of each is about 137% so about 2/3 or more of the people only gave one reason. As you can see for both groups the top reasons are lack of money, lack of need and high fees. That seems to cover most people. 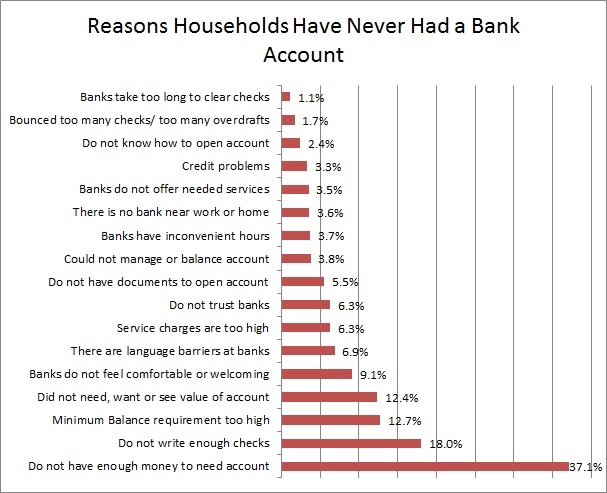 Past that though there are a variety of reasons people don't have bank accounts. Everything from not trusting banks, having language problems and not having a bank nearby.